"gelombang kejutan" dilencongkan ke sini. Untuk kegunaan lain, sila lihat gelombang kejutan (nyahkekaburan). "Kejutan bom" dilencongkan ke sini. Untuk Cirian transformer, sila lihat Mikromaster. Foto Schlieren suatu kejutan tergantung pada suatu jasad supersonik berbentuk mancung. Suatu gelombang kejutan (juga dipanggil sebagaidepan kejutan atau hanya "kejutan") adalah sejenis gangguan rambatan. Ia membawa tenaga dan boleh merambat menerusi suatu medium (pepejal, cecair, gas atau plasma) seperti gelombang biasa, atau di dalam beberapa kes di dalam ketiadaan medium bahan, menerusi suatu medan seperti medan elektromagnet. Gelombang kejutan boleh dicirikan oleh suatu peubahan mendadak yang terputus-putus di dalam ciri-ciri medium tersebut. Merentasi kejutan tersebut biasanya terdapat kenaikan mendadak yang melampau di dalam tekanan, suhu dan ketumpatan suatu aliran. Di dalam aliran supersonik, pengembangan dijayakan menerusi satu kipas pengembangan. Suatu gelombang kejutan bergerak menerusi kebanyakan media pada kelajuan yang lebih tinggi daripada gelombang biasa. Tidak seperti soliton (jenis gelombang bukan linear yang lain), tenaga gelombang kejutan hilang secara relatifnya cepat dengan jarak. Juga, pengiringan pelebaran gelombang mendekati dan akhirnya akan bersambung dengan gelombang kejutan, sebahagiannya akan membatalkannya. Akhirnya dentuman bunyi yang berkait rapat dengan laluan pesawat supersonik telah dihasilkan oleh degradasi dan menyambung kembali gelombang pengembangan telah dihasilkan oleh pesawat. Apabila suatu gelombang kejutan melalui jisim, jumlah tenaga disimpan yang boleh dikeluarkan sebagai kerja berkurangan dan entropy meningkat. Ini, sebagai contoh, mencipta daya gelombang heretan pada pesawat dengan kejutan. Normal: pada 90° (berserenjang) dengan arah aliran medium kejutan. Serong: pada suatu sudut keadan arah aliran. Haluan: Wujud di (busur) hadapan huluan bagi sebuah objek tumpul apabila halaju huluan melebihi Mach 1. Barisan sentuhan: di dalam gelombang kejutan yang dihasilkan oleh seorang pendorong gas (produk letupan) dan gas-gas (udara) yang dilepaskan. Barisan sentuhan menjejak barisan kejutan. Rencana ini memerlukan kemaskini dalam Bahasa Melayu piawai Dewan Bahasa dan Pustaka. Sila membantu, bahan-bahan boleh didapati di Gelombang kejutan (Inggeris). The abruptness of change in the features of the medium, that characterize shock waves, can be viewed as a phase transition: the pressure-time diagram of a supersonic object propagating, shows how the transition induced by a shock waves is analog to a dynamic phase transition. When an object (or disturbance) moves faster than the information about it can be propagated into the surrounding fluid, fluid near the disturbance cannot react or "get out of the way" before the disturbance arrives. In a shock wave the properties of the fluid (density,pressure, temperature, velocity, Mach number) change almost instantaneously. Measurements of the thickness of shock waves have resulted in values .2 micrometers (10-5 in), which is on the same order of magnitude as the mean free gas molecule path. In reference to the continuum, this implies the shock wave can be treated as either a line or a plane, if the flow field is 2d or 3d respectively. Gelombang kejutan terhasil apabila kelajuan suatu bendalir melebihi kelajuan bunyi. Gelombang bunyi bergerak menentang arus mencecah suatu titik di mana ia tidak boleh bergerak jauh lagi, menambahkan tekanan yang tertumpu di kawasan tersebut lalu menghasilkan gelombamg tekanan bertekanan tinggi secara mendadak. Shock waves are not conventional sound waves; a shock wave takes the form of a very sharp change in the gas properties on the order of a few mean free paths (roughly micro-meters at atmospheric conditions) in thickness. Shock waves in air are heard as a loud "crack" or "snap" noise. Over longer distances a shock wave can change from a nonlinear wave into a linear wave, degenerating into a conventional sound wave as it heats the air and loses energy. The sound wave is heard as the familiar "thud" or "thump" of a sonic boom, commonly created by thesupersonic flight of aircraft. The shock wave is one of several different ways in which a gas in a supersonic flow can be compressed. Some other methods are isentropiccompressions, including Prandtl-Meyer compressions. The method of compression of a gas results in different temperatures and densities for a given pressure ratio, which can be analytically calculated for a non-reacting gas. A shock wave compression results in a loss of total pressure, meaning that it is a less efficient method of compressing gases for some purposes, for instance in the intake of a scramjet. The appearance of pressure-drag on supersonic aircraft is mostly due to the effect of shock compression on the flow. In elementary fluid mechanics utilizing ideal gasses, a shock wave is treated as a discontinuity where entropy increases over a nearly infinitesimal region. Since no fluid flow is discontinuous, a control volume is established around the shock wave. With the control surfaces the exit lines into and out of the region. At the control surfaces assuming these are parallel to the shock wave, momentum, mass flux, and energy are constant. It is assumed the system is adiabatic (no heat exits or enters the system) and no work is being done. Taking into account the established assumptions, in a system where the downstream properties are becoming subsonic: the upstream and downstream flow properties of the fluid are considered isentropic. Since the total amount of energy within the system is constant, the stagnation enthalpy remains constant over both regions. Though, entropy is increasing this must be accounted for by a drop in stagnation pressure of the downstream fluid. Similar phenomena affect strong sound waves in gas or plasma, due to the dependence of thesound speed on temperature and pressure. Strong waves heat the medium near each pressure front, due to adiabatic compression of the air itself, so that high pressure fronts outrun the corresponding pressure troughs. While shock formation by this process does not normally happen to sound waves in Earth's atmosphere, it is thought to be one mechanism by which the solar chromosphere and corona are heated, via waves that propagate up from the solar interior. Gelombang kejutan boleh digambarkna sebagai titik paling jauh menentang arah objek bergerak yang "mengetahui" tujuan objek tersebut. In this description, the shock wave position is defined as the boundary between the zone having no information about the shock-driving event, and the zone aware of the shock-driving event, analogous with the light cone described in the theory of special relativity. To get a shock wave something has to be travelling faster than the local speed of sound. In that case some parts of the air around the aircraft are travelling at exactly the speed of sound with the aircraft, so that the sound waves leaving the aircraft pile up on each other, similar to a tailback on a road, and a shock wave forms, the pressure increases, and then spreads out sideways. Because of this amplification effect, a shock wave is very intense, more like an explosion when heard (not coincidentally, since explosions create shock waves). Terdiri daripada gelombang kejutan yang terserak ke mediun yang kaku - In this case, the gas ahead of the shock is stationary (in the laboratory frame), and the gas behind the shock is supersonic in the laboratory frame. The shock propagates with a wave front which is normal (at right angles) to the direction of flow. The speed of the shock is a function of the original pressure ratio between the two bodies of gas. Moving shocks are usually generated by the interaction of two bodies of gas at different pressure, with a shock wave propagating into the lower pressure gas, and an expansion wave propagating into the higher pressure gas. Gelombang ledakan secara asasnya ialah kejutan yang disokong tindak balas eksoterma yang berikutan. Ia melibatkan pergerakan suatu gelombang melalui bahan mudah meletup atau tidak stabil medium kimianya. Tindak balas kimia berlaku berikutan gelombang ini lalu tenaga kimia yang dihasilkan mendorong helombang ke hadapan. Gelombang jenis ini mengikut peraturan yang sedikit berbeza daripada kejutan biasa memandangkan ia berlaku hadapan gelombang kejutan. Dalam teori peledakan yang paling senangnya, suatu gelombang peledakan yang tersebar dengan sendirinya tanpa sebarang sokongan bergerak mara pada halaju Chapman-Jouguet. A detonation will also cause a shock of type 1, above to propagate into the surrounding air due to the overpressure induced by the explosion. Apabila sesebuah gelombang kejutan dihasilkab bahan letupan tinggi seperti TNT (yang berhalaju ledakan sebanyak 6,900 m/s), ia akan sentiasa bergerak pada halaju supersonik yang tinggi dari titik mulanya. 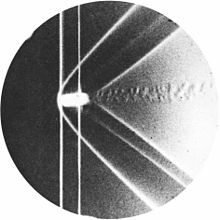 Shadowgraph of the detached shock on a bullet in supersonic flight, published by Ernst Mach in 1887. Kelihatan bercantum kepada hujung tajam badan e tip yang bergerak pada kelajuan yang sangat tinggi. 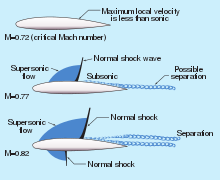 Where the flow over the suction side of a transonic wing is accelerated to a supersonic speed, the resulting re-compression can be by either Prandtl-Meyer compression or by the formation of a normal shock. This shock is of particular interest to makers of transonic devices because it can cause separation of the boundary layer at the point where it touches the transonic profile. This can then lead to full separation and stall on the profile, higher drag, or shock-buffet, a condition where the separation and the shock interact in a resonance condition, causing resonating loads on the underlying structure. Shock waves can also occur in rapid flows of dense granular materials down inclined channels or slopes. Strong shocks in rapid dense granular flows can be studied theoretically and analyzed to compare with experimental data. Consider a configuration in which the rapidly moving material down the chute impinges on an obstruction wall erected perpendicular at the end of a long and steep channel. Impact leads to a sudden change in the flow regime from a fast movingsupercritical thin layer to a stagnant thick heap. This flow configuration is particularly interesting because it is analogous to some hydraulic and aerodynamic situations associated with flow regime changes from supercritical to subcritical flows. Astrophysical environments feature many different types of shock waves. Some common examples are supernovae shock waves or blast waves traveling through the interstellar medium, thebow shock caused by the Earth's magnetic field colliding with the solar wind and shock waves caused by galaxies colliding with each other. Another interesting type of shock in astrophysics is the quasi-steady reverse shock or termination shock that terminates the ultra relativistic wind from young pulsars. Kerosakan disebabkan oleh gelombang kejutan "lintas terbang" meteor. Peristiwa meteor Russia pada 1908 dan 2013 adalah bukti-bukti paling sempurna didokumentasikan mengenai gelombang kejutan yang dihasilkan oleh suatumeteoroid berjisim. like in fourth-generation jet fighter flyby (ex. 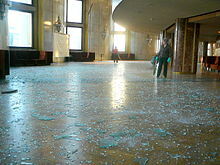 ), in the "near to the floor" meteor's trajectory. like in a detonation wave, with the circular shock wave centered at the meteor explosion (pictured). The wave disk engine (also named "Radial Internal Combustion Wave Rotor") is a kind ofpistonless rotary engine that utilize the shock waves to transfer energy between a high-energy fluid to a low-energy fluid, thereby increasing both temperature and pressure of the low-energy fluid. Krehl, Peter O. K. (2011), "Shock wave physics and detonation physics—a stimulus for the emergence of numerous new branches in science and engineering", European Physical Journal H, 36: 85, Bibcode:2011EPJH...36...85K, doi:10.1140/epjh/e2011-10037-x. KB Free finite-element educational software to simulate shocks and detonations. Laman ini diubah buat kali terakhir pada 15:40, 1 Mac 2018.